Besides offering five program tracks for students and alumni of all ages and places in their careers, there was an opening “teaching” and “doing” session on mentoring. The luncheon keynote speakers also delivered powerful messages. Sandra Simkins, a U-D alum, is the director and co-founder of The Children’s Justice Clinic At Rutgers University School of Law. Professor Simkins gave some powerful examples of the work she does on behalf of juveniles in Camden, New Jersey, while showing future law students and lawyers one route of public interest law that can help change the world. Ted Ruger, Dean of the University of Pennsylvania Law School, discussed important factors for law school admissions, such as becoming more accessible to those that might not have the financial wherewithal, as well as issues of LSATS, GREs and GPAs—all things too far in my own past to fully recall or comprehend. A number of law schools from the region, including my own Temple University School of Law, set up tables and sent representatives to offer up advice and enrollment information to the inquisitive U-D student attendees. Thanks to an invitation from Associate Dean for Social Science David C. Wilson, at the suggestion of Alumni HenLaw Steering Committee Chair Kandis Kovalsky (one of my star “pupils” at Kang Haggerty & Fetbroyt in Philadelphia), I was invited to speak on a panel in the “Navigating the Successes and Failures of the Legal Profession” track on “balancing the workplace and personal life.” I was especially pleased to participate because of the role Delaware law firms have played in my own consultancy. I’ve worked with nearly a dozen Delaware firms since 2001, and have not only found the interactions rewarding, but came to learn just how powerful those circles are in the national legal landscape (from the Chancery Court to game-changing bankruptcy and intellectual property practices). Many of my former Delaware attorney clients have become trusted colleagues and dear friends. Moderated by Nancy Karibjanian, director of the U-D Center for Political Communication, I joined Iva Ferrell, chief diversity officer of Widener University and Sharon Oras Morgan, managing partner with Fox Rothschild’s Wilmington, Delaware office to converse about some of the issues to consider in not only picking a law firm, but choosing a law career that fits your life and the choices that you wish to make. We all came to the panel from different places and different angles. But we all agreed that everyone puts a different value on different things. Do what fits you. In our discussion, I mentioned having just read a study of the top 10 female and family-friendly law firms, noting that they were all Big Law, and if you were truly interested in female or family-friendly, you might want to think about a different place. Almost on cue, one of those “award-winning” friendly spots was hit this week with a $100M Pregnancy Bias Suit. According to Law360, “Three California-based associates hit Morrison & Foerster LLP with a $100 million proposed class action Monday that alleges the firm delays pay and advancement opportunities for female attorneys who take maternity leave or avail themselves of benefits the firm offers working mothers.” This story went hand-in-hand with my anecdote of an attorney friend taking the paternity leave that his law firm offered up—only to feel the steely eyed glare from members of the firm—yeah, that friendly perk existed, but you really are not supposed to take it. 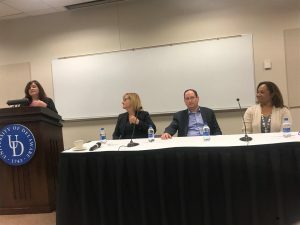 This was not saying that going the Big Law route was a misstep, but more that you should realistically balance the various factors that come with the lifestyles of different legal careers—be it small, midsize, boutique, in-house, non-traditional. What fits your own hopes and dreams? 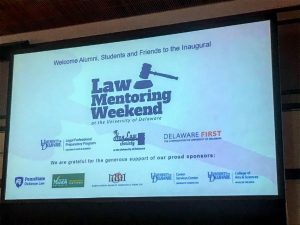 Other learning and experience tracks offered during the Law Mentoring Weekend included success in the law school admissions process, preparation for a successful legal career, creating the HenLaw Society Mentoring Program, and understanding and identifying implicit bias. If you are a U-D alum, a Delaware lawyer or a law student in the region—consider looking for future programs. I’m not sure how many other major universities without law schools offer similar programming, but this was an excellent approach to helping future law students, current law students and attorneys navigate the legal landscape at all stages of their respective careers.